Roger McMillan took this fun new trimaran for a quick dash around Pittwater. Unlike Jordan Spencer (see Weta boat test on the following pages), the conditions for my boat test of the Multi23 were far from ideal – cold, wet and miserable, as the photographs attest. However, if I had to use one word to describe this zippy little trimaran it would be “fun”. Despite the cold, I came ashore with a big grin on my face. I was joined on board by the NSW agent, Johan Betrom, and experienced multihull sailor, Peter Barron. Johan is a multihull designer and has worked with Marc Van Peteghem and Vincent Lauriot Prevost, the naval architects who designed the Multi23. The first indication of extreme speed was the hissing of the water off the main hull as soon as Johan let go of the mooring line.Keen to impress me, Johan wasted no time in hoisting the 22m2 screacher. Attached to the bow, the screacher is furled and folded along the edge of the main hull when not in use. A quick haul on the halyard from the safety of the cockpit, and it is up. With a sail area the same as the main, the screacher adds enormous power to the rig, and we were soon reaching along at around 12-14 knots, with the main hull threatening to come out of the water at any moment. There is a decent gap between the forestay and the screacher luff so gybing is very easy to accomplish. A retractable prodder would make it even more so, and would expose more of the sail when going downwind. This is under consideration, and would be easy to retro-fit into the forward bulkhead, which is accessible via a large hatch. The only other improvement I would make, for even better performance down wind, would be to rig tweakers to widen the sheeting angle. The screacher is sheeted back to the main hull under the current configuration. Again, this would be very easy to accomplish. I did have a problem with the screacher back-winding if we got a little too high, but generally it was easy to set and provided good visibility for the helmsman beneath the high-flying clew. When we furled the screacher and unfurled the self-tacking jib, I was pleasantly surprised both by the speed and the angle. Peter, much more experienced at measuring such things on a multihull, confirmed that the Multi23 points as well as other multihulls he has raced, and is “very quick” into the wind. We were working off an Etchells that was heading in the same direction, and although we could only point about 60 degrees to the wind, our superior speed had us quickly making gains. Taking the helm, I was pleasantly surprised at the ultra light feel in the tiller. Two carbon tiller extensions reach right to the outer pontoon, and it was enormous fun perched high on the windward hull. The boat felt perfectly balanced and steering was completely effortless. Tacking was a delight, with the powerul rig quickly giving the boat speed out of the turn. I was impressed with the look of the Multi23 when viewed from alongside. It is a seriously good looking little beast. The move to the chase boat also allowed me to make observations about crew placement, and the weight appeared to be slightly too far aft. Because the Multi is so well balanced, such fine-tuning is extremely easy to achieve and makes a real difference to performance. There are a number of very clever design features to the Multi23. She is a very stiff boat, thanks to the use of carbon in key areas of the beams. You don’t experience the flex that many trimarans have, which keeps everything in line and working to maximum capacity. In fact, the whole construction process is very modern and effective. The three hulls are constructed of infused Vinylester resin over fibreglass and Corecell foam on the deck and topsides, with solid glass underwater. Designed to carry up to six people, the Multi23 is also a very safe boat for family sailing. The hulls all have a lot of their volume in the bows which are ever-so-slightly reversed, giving increased bouyancy and lessened resistance. The antiskid finish on the decks of all hulls makes moving around the boat safe, and there are hiking straps that run the length of the trampoline. One of the factors that has always held back multihull sailing is the room they take up, whether in a marina or on a trailer. Like everything else about this boat, a lot of thought has gone into solving this predicament. Australian importer, Rohan Claringbold, has designed a trailer that carries the three hulls and two crossbeams disassembled with a total width of only 2.2m. On arriving at the ramp, the wings of the trailer fold out, taking the pontoons with them. The crossbeams are then fixed in place with one bolt at each contact point and the trailer is then backed into the water. Rohan says that from arrival to sailing away takes about an hour, with a similar time required to pack everything away again for the trip home. This is obviously happening overseas, with 50 Multi23s racing around the world. There are 30 in Europe, 14 in the USA, four in Asia and two here in Australia. At $60,000 including sails and trailer, there is every chance that Peter’s suggestion will bear fruit. The Multi23 had its first outing at the APC multihull regatta at Wangi in November. 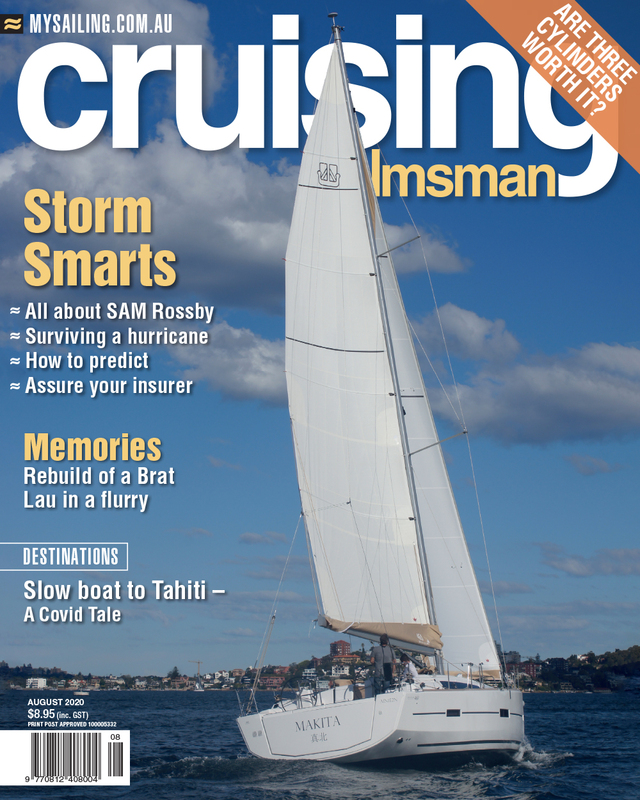 This edition had gone to print before the event, but you will find results on the mysailing.com.au website. The Multi23 ticks all the boxes as far as modern design, quality of construction, ease of handling and simplicity of transportation. But the biggest box it ticks is the one marked “fun”. I might suggest to Johan that the photographs weren’t up to scratch, so I need to go out on her again in better weather.